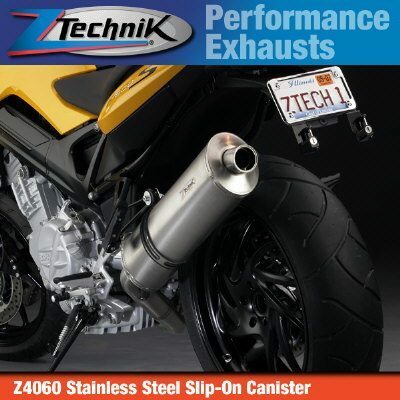 BMW F800S exhaust and F800ST exhaust from Ztechnik if you want to pull away from the competition with form, function and performance, ZTechnik is the only line to take. The new Z4060 Stainless Steel Slip-On is the perfect match for every F800S/ST rider who wants to step it up a notch on the twisty roads or on those long hauls. With a 6.0 ft. lb. torque increase and a noticeable boost in horsepower, this will be a must-buy for every rider who wants better looks and greater performance. As with all ZTechnik Exhaust Systems, your engine warranty remains valid after the system is installed! Slimmer canister profile, 6.92 lbs. lighter than stock. Features a removable dB Killer™ for an aggressive sound to match its performance.